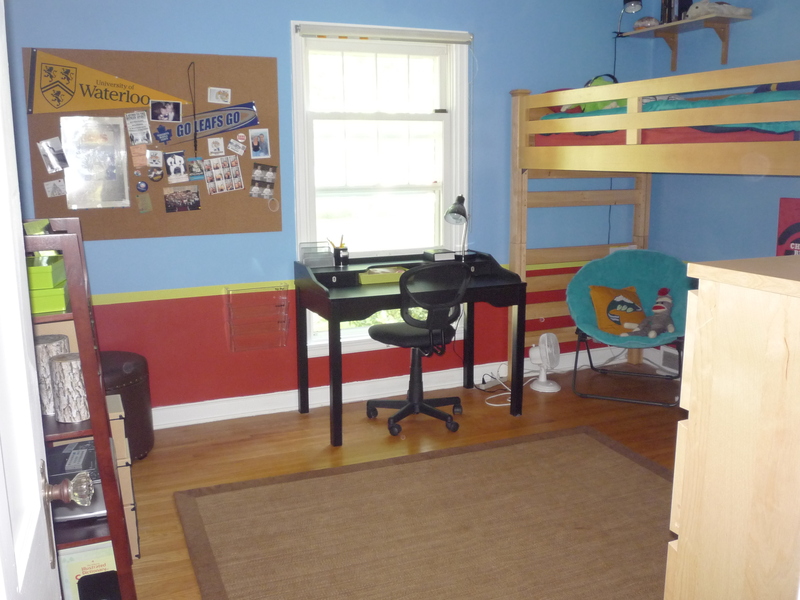 Now that Jesse has seen his new room, I can finally share photos with you. Many, many thanks to the lovely Sonia Mosch of Therapeutic Design for helping us to conceptualize the space based on Jesse’s specific interests, tastes, study habits and psychological profile–a highly extroverted young man who is distracted somewhat (who are we kidding, that is obviously an understatement?!) by socializing but wants to excel at his studies. She was fun, insightful, savvy and used all of the right teenage vocab (“chill zone” and “study zone.”) She also shared with Jesse lots of useful information regarding psychology and strategies for effective teen study habits that he can put to work in the upcoming years. Sonia suggested color palettes, furniture purchases and layout of the room which gave clear direction to our DIY project, while also allowing us to bring some of our own ideas and creativity to the mix. She was fantastic to work with and a real professional. Thanks, Sonia! Below is one BEFORE and one AFTER photo. If you want to see more photos (there are LOTS more), visit my Facebook album, here. Can’t wait to hear what you think, friends!